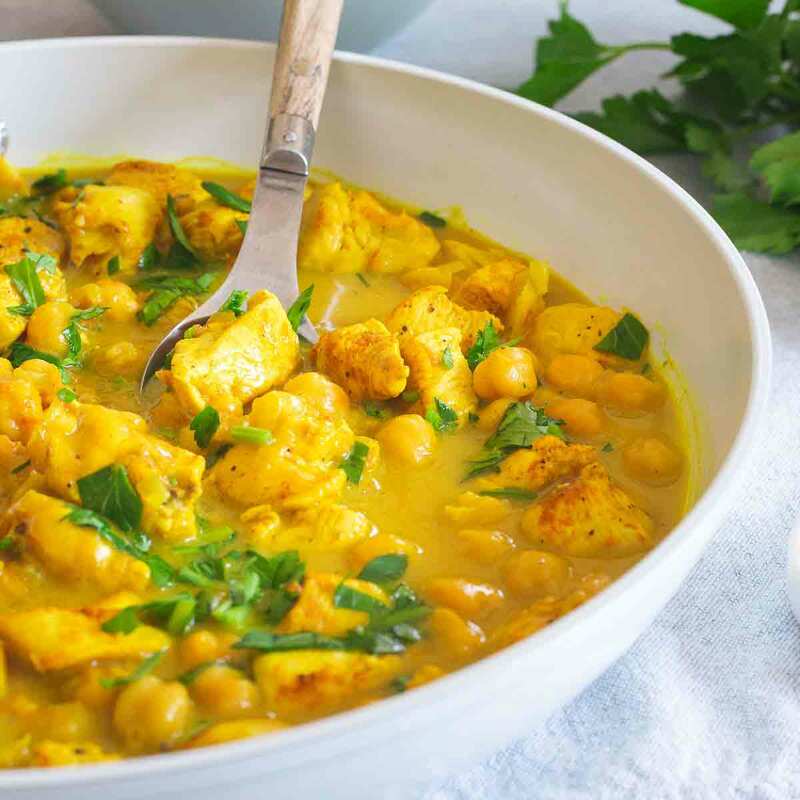 This creamy turmeric chicken is an easy one-skillet meal with hearty chickpeas. Serve it over rice with a cilantro garnish for a delicious dinner in under 30 minutes. Back with another turmeric centered recipe for you. I really wasn’t kidding about what I said in the baked turmeric oatmeal recipe, I have a lot of the stuff right now so it’s getting some use! I talked about the health benefits of turmeric last time (you can see them for yourself in this turmeric lentil stew recipe if you need to catch up) so we’re all well aware of how great this magical spice is for us by now, right? This turmeric chicken recipe uses two types of turmeric: fresh and ground. Cooking chicken with turmeric seems like a no-brainer. I think chicken is most peoples go-to protein for quick and easy weeknight meals and that’s exactly what this turmeric chicken skillet is. How Do You Make Turmeric Chicken? Like I mentioned, turmeric gets double duty use in this recipe. The freshly grated turmeric root gets sautéed with the onions as the first step in the recipe. Then, the chicken gets seasoned with ground turmeric in addition to salt and pepper before being added to the skillet. While fresh and ground turmeric are obviously the same in origin, they do impart slightly different flavors. Fresh turmeric root is a bit milder, almost gingery and kind of tastes like a spicy carrot if you ate it raw! It brings a certain punch of freshness to the recipe. Ground turmeric is more savory in nature and loses a bit of that fresh pungency that the fresh stuff has. It still brings lots of health benefits, warmth and color to any dish it’s used in. What Do You Serve with Creamy Turmeric Chicken? I love serving this dish over white rice. Fragrant jasmine rice is my favorite but any will do. I tend to batch cook rice at the beginning of the week so I have a large container of it on hand and ready to go for the week’s meals. This is the perfect example of how that’s useful. Even if you don’t “meal prep” per se, try batch cooking a few sides (like rice, roasted vegetables, etc.) to make dinner come together easier during the week. It really cuts down on prep time! Of course, you could use brown rice if preferred (I’m just not into its longer cooking time these days) or even cauliflower rice if you want something lower carb. Or, for a triple turmeric boost, make the turmeric ginger rice from this Instant Pot coconut pork recipe. Mmm, that would be so good! 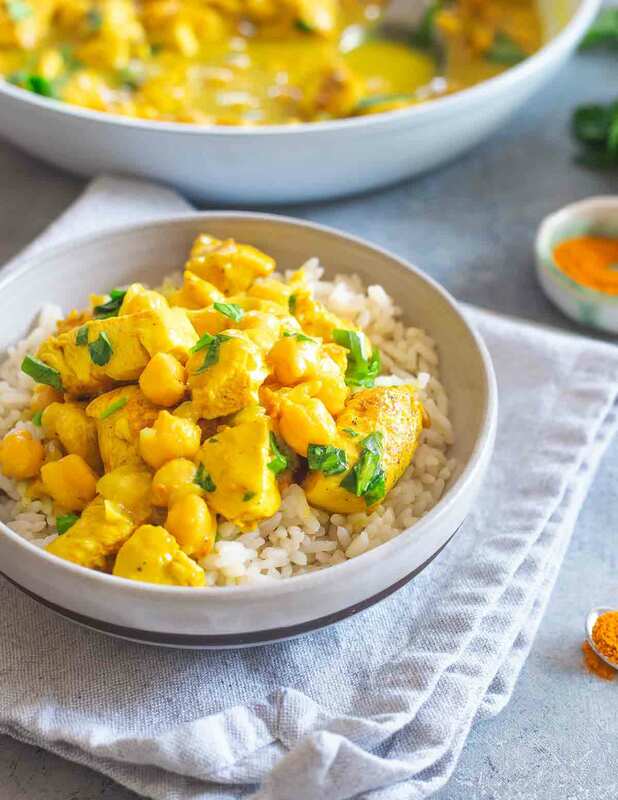 What Does Turmeric Chicken with Chickpeas Taste Like? 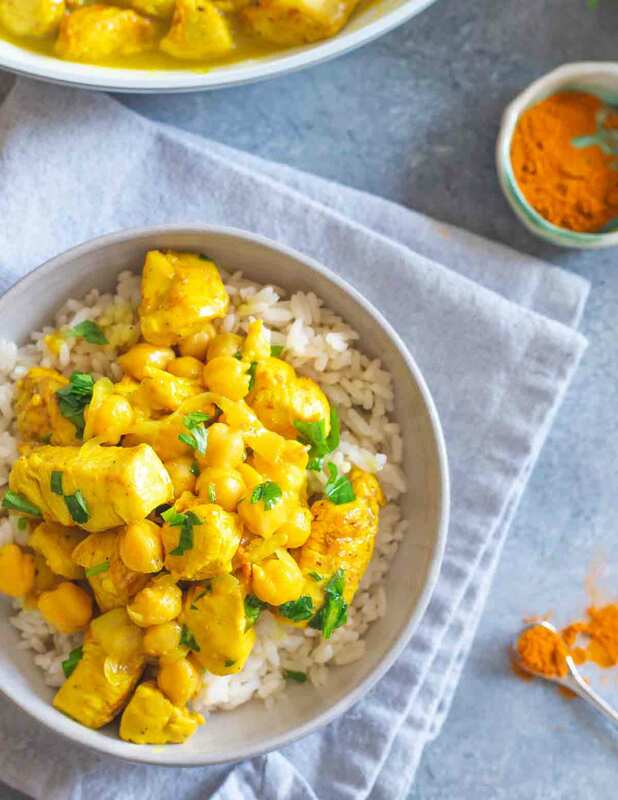 The best part about this chicken and turmeric dish is not even the fact that it’s made all in one pan or that it takes less than 30 minutes to cook, it’s the taste! This skillet meal is almost reminiscent of a curry (this winter vegetable curry comes to mind actually) just without the curry powder taste. 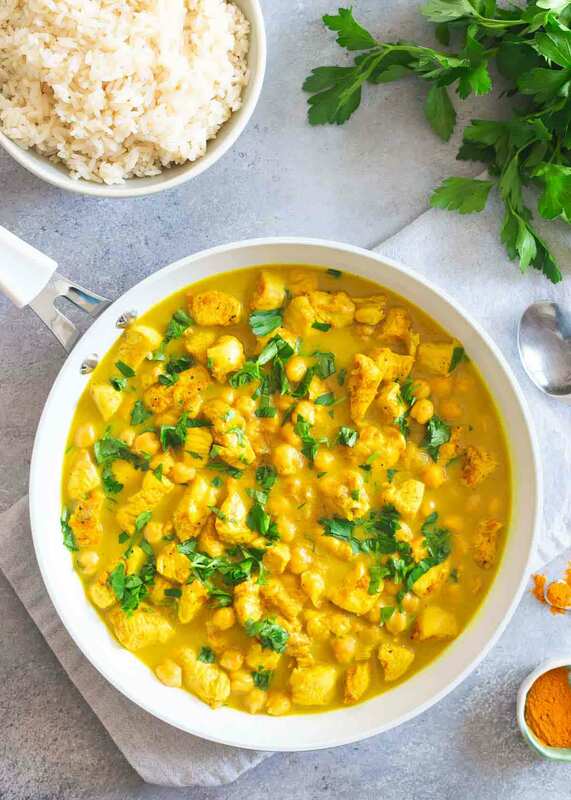 It’s creamy and decadent thanks to the coconut milk, hearty and filling thanks to the added chickpeas but still fresh and light from the fresh turmeric and herbs. Love this creamy chicken turmeric recipe? Definitely try these other one-skillet/sheet-pan chicken dinner recipes too: Jalapeno Mango Chicken Skillet, Chicken Artichoke Olive Skillet, Chinese Chicken Zoodles, Sheet Pan Maple Mustard Chicken with Pecans and Sweet Potatoes. Also try these snacks and desserts with turmeric: turmeric energy balls and brown butter turmeric chocolate chip cookies. So fun! Melt coconut oil in the pan. Add onions and fresh turmeric and sauté for about 3 minutes until softened. While onions cook, season the cubed chicken with salt, pepper, ground turmeric and ground ginger and toss to combine. Add chicken to the skillet and brown for about 3 minutes per side. Add the broth and coconut milk to the skillet, stir to combine and simmer over medium-low heat for 5 minutes. Add the chickpeas and continue cooking another 5 minutes. Remove from heat, garnish with fresh herbs and serve over rice. Just found your website after looking for a recipe to use my leftover juicing pulp (Muffins), which I will make tomorrow. Saw this dinner recipe and decided to give it a try! It is cooking right now; will check back to say how it turned out even though I’m sure it’s delicious. Thanks for sharing all of your yummy inspirations! So glad to have you – hope you enjoyed dinner! If I don’t have fresh turmeric can I just put more powdered turmeric? Or should I wait to make it until I can get some fresh? You can just use the ground turmeric, I’d probably do about 1 1/2 teaspoons. The flavor will be slightly different without the fresh but it’s not imperative for the recipe. Enjoy!